Xeden is a palatable tablet containing the broad spectrum antibiotic enrofloxacin. Xeden for cats is used particularly for respiratory infections. 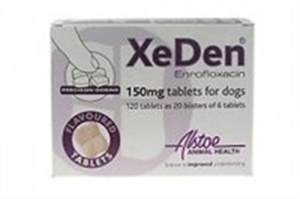 Xeden for dogs is used particularly for urinary tract infections and skin infections. A course of tablets is usually 5 to 10 days for cats. For dogs, a course of treatment can be up to 7 weeks for serious skin infections, such as deep pyoderma. Most infections should clear up in less time than this. Xeden is normally given once daily. 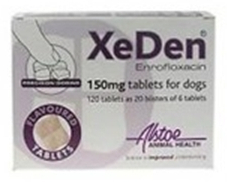 Xeden tablets are not normally recommended for use in rapidly growing young animals due to possible adverse effects on growing cartilage in the joints. Treatment of lower urinary tract infections (associated or not with prostatitis) and upper urinary tract infections caused by Escherichia Coli or Proteus mirabilis. Treatment of superficial and deep pyoderma. Do not use in young or growing dogs (dogs aged less than 12 months (small breed) or less than 18 months (large breed)) as the product may cause epiphyseal cartilage alterations in growing puppies. Do not use in dogs having seizure disorders, since enrofloxacin may cause CNS stimulation. Do not use in dogs with known hypersensitivity to fluoroquinolones or to any of the excipients of the product. Do not use in case of resistance to quinolones, as there exists almost complete cross resistance to other quinolones and complete cross resistance to other fluoroquinolones. Do not use with tetracyclines, phenicols or macrolides because of potential antagonistic effects. Fluoroquinolones should be reserved for the treatment of clinical conditions which have responded poorly, or are expected to respond poorly, to other classes of antimicrobials. Wherever possible, fluoroquinolones should be used based on susceptibility testing. Use of the product deviating from instructions given in the SPC may increase the prevalence of bacteria resistant to fluoroquinolones and may decrease the effectiveness of treatment with other quinolones due to the potential for cross resistance. Official and local antimicrobial policies should be taken into account when the product is used. Use the product with caution in dogs with severe renal or hepatic impairment. Pyoderma is mostly secondary to an underlying disease. It is advisable to determine the underlying cause and to treat the animal accordingly. The chewable tablets are flavoured. In order to avoid any accidental ingestion, store tablets out of reach of the animals. Possible joint cartilage alterations in growing puppies. In rare cases vomiting and anorexia are observed. In rare case, hypersensitive reactions may occur. In this case, the administration of the product should be stopped. Neurological signs (seizures, tremors, ataxia, excitation) can occur. Use during pregnancy: Laboratory studies in laboratory animals (rat, chinchilla) have not produced any evidence of a teratogenic, foetotoxic, maternototoxic effect. Use only according to the benefit/risk assessment by the responsible veterinarian. Use during lactation: As enrofloxacin passes into the maternal milk, the use is not recommended during lactation. Concurrent use of flunixin should be under careful veterinary monitoring, as the interactions between these drugs may lead to adverse events related to delayed elimination. Concomitant administration of theophylline requires careful monitoring as serum levels of theophylline may increase. Concurrent use of magnesium or aluminum containing substances (such as antacids or sucralfate) may reduce absorption of enrofloxacin. These drugs should be administered two hours apart. The treatment should be reconsidered in case of lack of clinical improvement at half of the treatment duration. The tablets are flavoured, and are well accepted by dogs. The tablets may be administered directly in the mouth of the dog or simultaneously with food if necessary. Overdosing can cause vomiting and nervous signs (muscle tremor, incoordination and convulsions) which may require treatment discontinuation. In the absence of any known antidote, apply drug elimination methods and symptomatic treatment. If necessary, administration of aluminium or magnesium-containing antacids or activated carbon can be used to reduce absorption of enrofloxacin. According to literature, signs of overdosage with enrofloxacin in dogs such as inappetence and gastrointestinal disturbance were observed at approximately 10 times the recommended dose when administered for two weeks. No signs of intolerance were observed in dogs administered 5 times the recommended dose for a month. Enrofloxacin is a synthetic fluoroquinolone antibiotic that exerts its activity by inhibiting topoisomerase II, an enzyme involved in the mechanism of bacterial replication. Enrofloxacin exerts bactericidal activity concentration-dependant with similar values of minimal inhibit concentration and minimal bactericide concentrations. It also possesses activity against bacteria in the stationary phase by an alteration of the permeability of the outer membrane phospholipid cell wall. In general, enrofloxacin exhibits good activity against most gram-negative bacteria, especially those of the Enterobacteriacea. Escherichia coli, Klebsiella spp., Proteus spp., and Enterobacter spp. are generally susceptible. Pseudomonas aeruginosa is variably susceptible and, when it is susceptible, usually has a higher MIC than other susceptible organisms. Staphylococcus aureus and Staphylococcus intermedius usually are susceptible. Streptococci, enterococci, anaerobic bacteria can generally be considered resistant. Induction of resistance against quinolones can develop by mutations in the gyrase gene of bacteria and by changes in cell permeability towards quinolones. • MICs values for Enrofloxacin in dogs (skin, soft tissue, respiratory and UTI), S ≤ 0.5 μg/mL; I: 1_2μg/mL; R ≥ 4μg/ml. Enrofloxacin is rapidly metabolised to form an active compound, ciprofloxacin. -The maximal plasma concentration of enrofloxacin of 1.72 µg/mL was observed one hour following administration. -The maximal plasma concentration of ciprofloxacin (0.32 µg/mL) was observed two hours following administration. Enrofloxacin is primarily excreted via the kidneys. A major portion of the parent drug and its metabolites is recovered in urine. Enrofloxacin is widely distributed in the body. The tissue concentrations are often higher than the serum concentrations. Enrofloxacin crosses the blood-brain barrier. The degree of protein binding in serum is 14% in dogs. The half-life in serum is 3-5 hours in dogs (5 mg/kg). Approximately 60 % of the dose is excreted as unchanged enrofloxacin and the remainder as metabolites, amongst others ciprofloxacin. The total clearance is approximately 9 ml/minute/kg bodyweight in dogs. Store in the original container. Protect from light. Divided tablets should be stored in the blister pack. Any divided tablet portions remaining after 3 days should be discarded. These medicinal products do not require any special temperature storage conditions. Cardboard box with 1 blister of 10 tablets; Cardboard box with 10 blisters of 10 tablets. Cardboard box with 2 blisters of 6 tablets; Cardboard box with 20 blisters of 6 tablets. In case of accidental ingestion, seek medical advice immediately and show the package leaflet to the physician. Wash hands after handling the product. In case of contact with eyes, rinse immediately with plenty of water. There are currently no questions for Xeden - be the first to ask one!